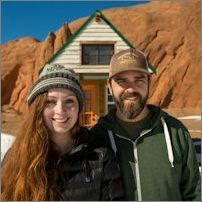 Alexis Stephens and Christian Parsons of Tiny House Expedition, are a filmmaker duo and ordinary couple taking an extraordinary road trip across the US & Canada with their DIY tiny house on wheels in tow. Through their documentary storytelling and direct community engagement, they seek to inspire people to think BIG and build small as means to provide more quality, affordable housing & more connected communities. Creative use of tiny housing is cultivating more connected community experiences and more meaningful relationships, for multi-millionaires to those transitioning out of homelessness; the tiny house itself is just the beginning of Turning Tiny!